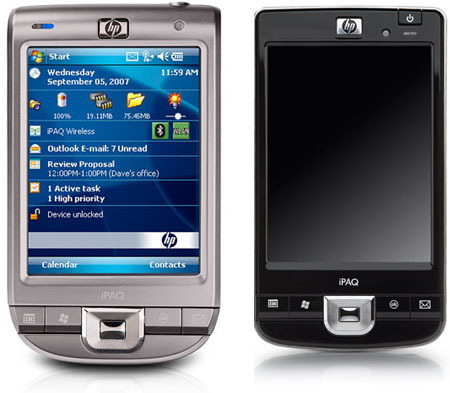 It's been quite a while since there were any shake-ups in the world of the HP iPaq, and suddently here come five new iPaq devices all at once: the 110, 210, 310, 610 and 910. The 110 Classic Handheld has a 3.5in, 320 x 240 display, runs Windows Mobile 6 and incorporates a 624MHz CPU with 64MB of internal memory. However, it's also got a slot for SD memory cards if users find that slightly limiting. It also provides Wi-Fi access over the 802.11b/g standards. Next up is the 210 Enterprise Handheld which, as its name suggests, offers more business-grade features, including a 4in display that also operates as a touchscreen. The memory card slot also supports a wider variety of formats, including MMC. However, the 210 still sports the same CPU and memory capacity as the 110, in addition to Wi-Fi and Bluetooth. 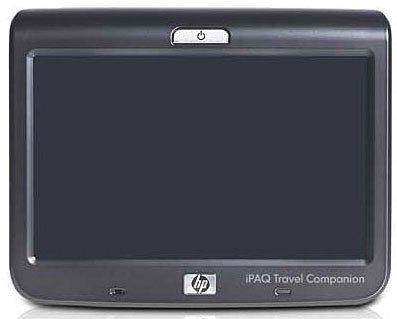 The 310 Travel Companion opts for the Windows CE operating system, perhaps because HP felt it would be better at displaying the 3D buildings that are incorporated into the TomTom-esque navigation software built into the device. It has a 4.3in touch-sensitive widescreen display, which should be better at displaying those maps or, because it has a big 800 x 480 resolution, could be used for displaying photographs or short films. It also has a slot for SD memory cards and Bluetooth connectivity. 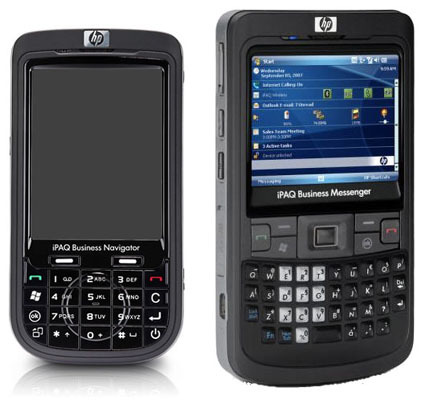 HP has branded the 610 and 910 as Business Navigator and Business Messenger, respectively. So users benefit from higher-end features, such a three-megapixel camera on both models, Bluetooth and Wi-Fi connectivity. Both also use the Windows Mobile 6. Both are quad-band GSM/GPRS/Edge and tri-band UMTS devices. However, the main differences between the two are that the 910 has a 2.4in touchscreen and also a full Qwerty keyboard, while the 610 has a 2.8in display and uses traditional mobile keypad for entering information. The 110 is expected to retail for $110 (£55/€65), the 210 for $400 (£200/€230), the 310 for $450 (£225/€250), the 610 for $525 (£270/€295) and the 910 for $600 (£300/€340). European release dates have not yet been confirmed.